The Master of Arts in Teaching (MAT) program offers four credential areas (Multiple Subject, Multiple Subject with Spanish/English Bilingual authorization, Single Subject, and Single Subject with Music Emphasis), with the option for pursuing just a credential, or a credential with a Master of Arts in Teaching degree. Students must declare their interest in the Master of Arts in Teaching (MAT) program on the admission application. Our unique teaching programs emphasize linguistic and culturally responsive pedagogy to meet the needs of an increasingly diverse student population in California schools, in an accelerated four semester (term) cohort model. The program demonstrates a strong foundation in developing skills for culturally responsive teaching and working with diverse learners and their families. The program continues to develop in the areas of technology and behavior/classroom management. The MAT Single Subject course sequence can be found here. The music emphasis can be found here. As course titles are lengthy, course numbers are provided below. The intern option allows students to waive foundational courses if they demonstrate expertise and experience in the associated area. The program includes a foundation semester (Term 1) in which teacher candidates take courses in educational theory and lesson development and design (EDUC 567), methods in literacy and reading with a 1:1 “hands-on” tutoring component in the Attallah College Kathleen Muth Reading Center (EDUC 532), and a course in teaching for social justice and culturally responsive pedagogy (EDUC 570). Teacher candidates also take a course on human development and wellness (EDUC 569). The second semester (TERM 2) includes courses focused on methods for working with diverse learners including: English Language Learners (EDUC 504), Exceptional Learners (EDUC 571), and methods courses in respective content areas (EDUC 517/EDUC518/MUS533), along with a practicum course that requires a minimum of 15 hours per week (225 hours over a 15 week semester) clinical experiences in which teacher candidates implement best practices they are acquiring in their courses in a diverse K-12 classroom. A letter explaining the practicum that is sent to mentor teachers can be found here. During the third semester (Term 3), candidates complete their student teaching requirements (EDUC 583/MUS 583), along with a methods courses in the respective content area (EDUC 518/EDUC 578/MUS 534), and a seminar course that covers wellness, inquiry, and professionalism (EDUC 589). Candidates are observed and assessed via TPE aligned rubrics a minimum of 6 times throughout the semester during their student teaching experience, including a formative and summative assessment aligned with the TPEs. Candidates also complete the required TPAs for their credential authorization area in this semester. The final semester (Term 4) includes an MAT Capstone Course (EDUC 696/MUS 698C) and a special topics course that allows students to delve deeper in to content including critical literacy and Ethnic Studies (EDUC 695). 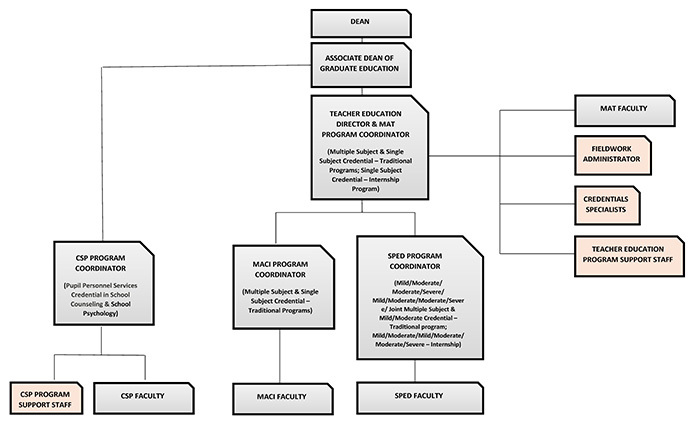 Provide an organizational chart or graphic to show how the program leadership and instructional personnel/staff are organized within the program and how the program fits into the education unit, including personnel serving in non-teaching roles, including the roles and responsibilities of those involved in assigning and placing mentors/coaches. The graphic should depict the chain of authority and include individuals up to the dean or superintendent level. If the program operates as a consortium with shared leadership, the graphic should include also include individuals serving in induction administrative roles in entities within the consortium. Three exhibits are required. One additional exhibit is only required if there are vacancies. a. Submit a faculty distribution table that provides an overview of faculty. The table should include numbers of full time, part time, and adjunct faculty. Vacancies should also be noted. b. Programs must also submit a current annotated faculty list denoting which courses are taught by which faculty, including part time faculty members. It is not necessary to include intermittent adjunct faculty unless they are the only instructor for a particular course. The annotated list should include the faulty member’s name, degree, status (fulltime, part time, adjunct), and list of the courses he/she teaches. c. Provide links to published documentation (e.g. job descriptions, online advertisements, contract language) regarding the experience and qualifications used to select adjunct faculty. Clear information about the sequence in which candidates take courses should be submitted. This should be a link to website, course catalog or other document that is readily available to candidates and prospective candidates. If the program is offered via more than one pathway or model, link to course sequence should be provided for each pathway or model, a link to course sequence should be provided for each pathway or model. 6.1 A Table that denotes the number of hours that each candidate is required to participate in early fieldwork and supervised clinical practice and how those hours are broken out across fieldwork/clinical experiences. It is appropriate for programs to label fieldwork experiences using your institution’s nomenclature. a) Memorandum of Understanding (MOU), Partnership Agreement, or link to published supporting document that clearly delineates the requirements of each candidate placement in alignment with the requirements of the Commission program standards for that program; expectations and criteria for veteran practitioner selection, training and evaluation; and support and assessment roles and responsibilities for the program and the district. b) Training Materials used to train Veteran Practitioners (for example, master teachers) serving in support and/or supervisory roles. d) Published Manuals or Handbooks or Advising Materials (links) that provide information to the district and candidates about expectations within the clinical experience including appropriate placements, veteran practitioner support, and information about clinical practice assessment. e) Syllabi for supervised clinical experiences. The syllabi should include information regarding how the candidate is assessed during clinical practice. Copies of blank assessment instruments should be included. Two exhibits are required. Provide a brief description (200 words or less) of the program’s process to ensure that only qualified candidates are recommended for the credential. The description should include a link to the program’s candidate progress monitoring document or other tracking tool used to verify that candidate has met all requirements for the program prior to recommendation. Chapman University maintains individual student records through PeopleSoft. Program based staff monitor and ensure accuracy of student progress via PeopleSoft. Candidates are given regular electronic updates regarding satisfaction of program requirements and are permitted to view their files including program process, transcripts, and through student access to PeopleSoft at any time (see sample student record here [[this is missing]]) Attallah College does not retain any paper records and electronic files are password protected and only accessible to Chapman University personnel. All student records are retained electronically indefinitely.